This finca-chic 400-year old farmhouse with pool has been given a luxurious contemporary update and now offers stylish, charming and parent-friendly self-catering accommodation for up to eight guests. The friendly owners, who live in the UK but have family nearby, fell in love with the house thanks to its charm and tranquil but convenient setting just a few minutes walk from the handy cluster of shops and restaurants in the scenic village of Xaghra on Gozo, a ravishingly unspoilt corner of the Mediterranean just a 25-minute frequent ferry hop from nearby Malta. 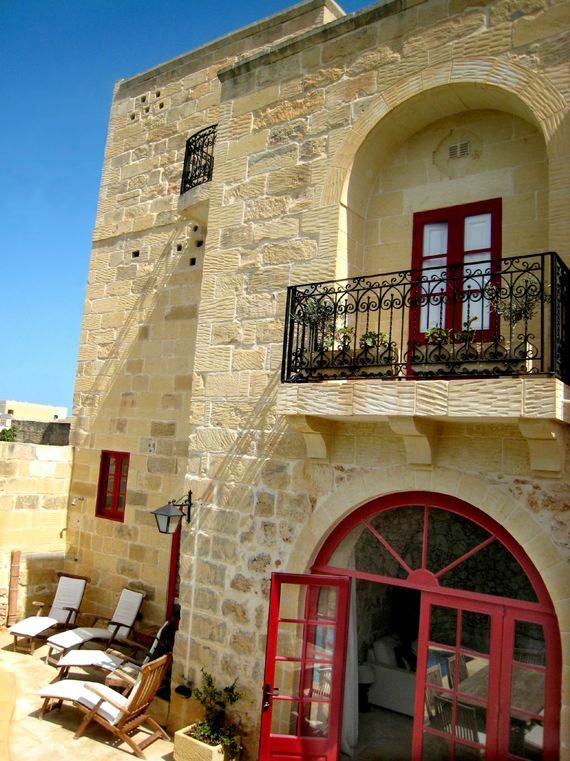 Razzett Pepprina's beautiful honey-coloured stone walls, and high arched ceilings give it tons of authentic charm and the Rollings family's careful renovation has preserved this in spades, whilst also adding touches that make it an immensely enjoyable place to spend a holiday. These new additions include balconies and roof terraces that offer stunning views. There's also a lovely private pool and pretty furnished terrace which, combined with the thoughtful welcome pack and friendly welcome by the house's local concierge, make for easy relaxation within a short time of arrival, especially since little ones will make a bee line for the toy chests and soon be playing happily in the spacious living areas. The house also has unusually spacious, light and airy rooms for such an old farmhouse and two new upper floors have been added to create more space for three large ensuite bedrooms. 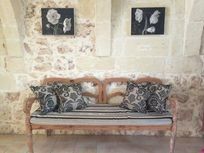 The Rollings have then finished off the farmhouse combining high quality furnishings with Maltese antiques and local art to give Razzett Pepprina both contemporary comfort and traditional charm. The fabulous stone kitchen/dining room with Maltese limestone worktops is a convivial room for cooking and has been well kitted out with SMEG appliances, Sabatier knives, quality pans and handy baby essentials. The striking living room features an amazing stone arched ceiling, real fire and Italian Natuzzi sofas, then there are two more reception rooms for children to play, complete with toys and loads of books. All the bedrooms are ensuite and have balconies, antique beds and crisp white linen, plus the top floor bedroom (which is safely lockable) has large roof terraces for gazing on the views by day and the stars by night. 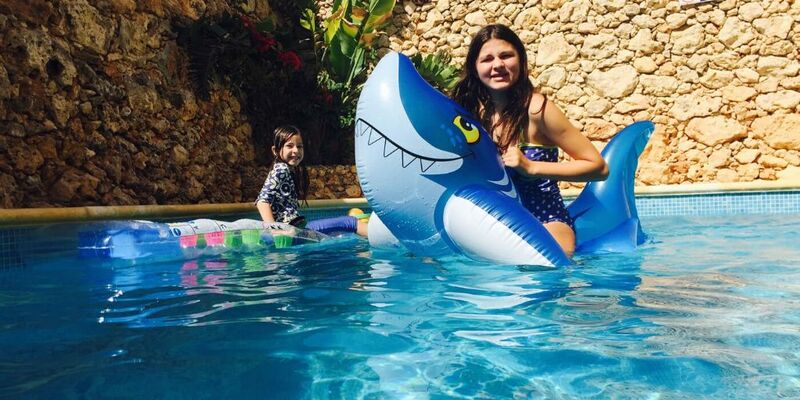 To enjoy the Gozo sunshine, Razzett Pepprina has a sunny south facing terrace and private 21x16ft pool, complete with elegant teak steamer loungers, outdoor dining table and a built in BBQ. 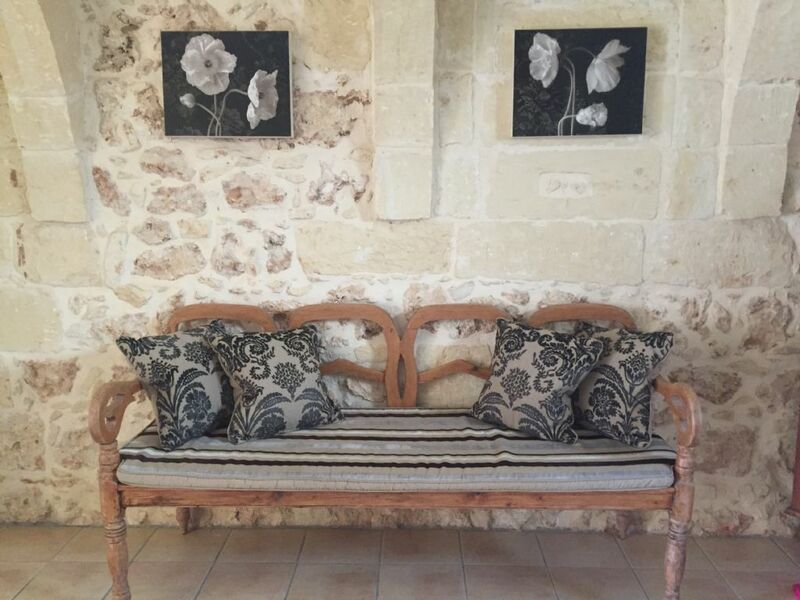 As past guests testify, a stay at Razzett Pepprina often feels akin to a personal, family-run boutique hotel. A warm meet and greet service helps guests settle in and a welcome pack includes local sour dough bread, local honey and basic essentials. Families with babies will find the personalised pre arrival shopping service, which can include nappies, wipes, formula, food jars etc, particularly helpful, whilst a local concierge makes everything easy, from arranging babysitters to boat trips to relaxing massages. In fact, most guests find it pretty hard to tear themselves a way once they've settle into a relaxed routine of long lazy breakfasts on the terrace, stocking up in the village, and afternoons by the pool before pre-dinner drinks in the town square, but the fact that there's a wide choice of lovely sandy beaches within a 15 minute drive usually provides enough temptation to pack the picnic bag, buckets and spades provided and head off for a day by the sea. 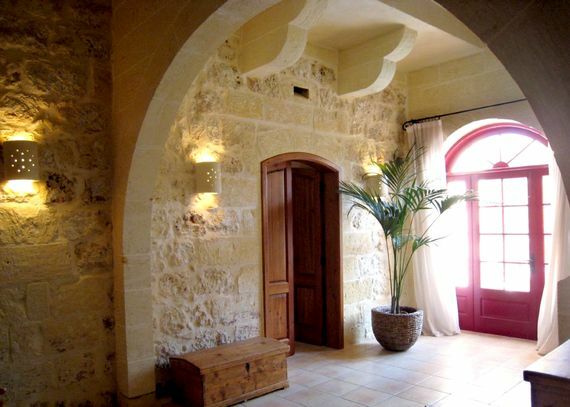 Ground floor - The very spacious ground floor comprises a wide entrance hall with traditional Maltese day bed and a cupboard stocked with beach toys, this leads through a wide stone archway into the second reception room which is ideal as playroom as comes stocked with toys and games. The comfortable lounge is a separate room furnished with a large sofa, armchairs and a real fire for cosy spring and autumn evenings. To one side, an enclosed archway has doors to the pool terrace with BBQ, whilst the other side has an archway to the kitchen diner which is well equipped with SMEG appliances including a large fridge freezer, dishwasher and washing machine, as well as the usually expected appliances. The dining table seats eight plus a highchair. First floor - The first floor double bedroom boasts a queen-sized cast iron bed, a balcony overlooking the pool and fields, plus an ensuite bathroom with bath, WC and basin. Also on the first floor is a spacious twin with two cast iron single beds, a double sofa bed and a balcony, plus an ensuite shower room with shower, WC and basin. The first floor also houses a third bedroom but this is inaccessible since it is used by the owners for storage. 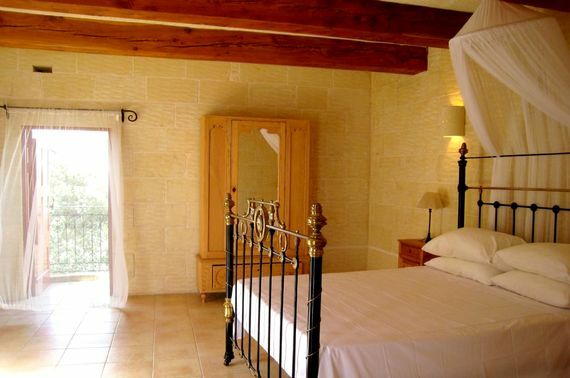 Second floor - The impressive second floor bedroom is very spacious and boasts a queen sized, cast iron double bed plus an ensuite shower room with shower, WC an basin plus a lovely roof terrace with wide reaching views over the island. 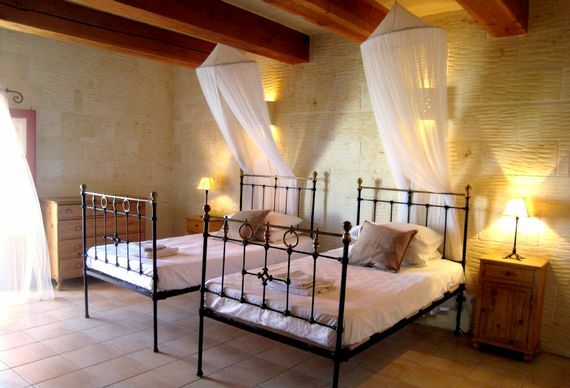 All three bedrooms have space for a cot and one travel cot is provided. Outside - Along with the balconies and roof terraces adjacent to the bedrooms, the house enjoys a south facing terrace with private swimming pool (measuring 21 feet x 16 feet) and stone barbecue. The terrace has a wooden dining table, eight chairs, parasol and four comfortable steamer style sun loungers. There are herbs growing next to the barbeque area which guests are welcome to use. There is plenty of outdoor lighting and the pool has underwater lights. This is a lovely space for an early evening glass of wine in the sun and for eating alfresco. The tiny Maltese island of Gozo is one of the Med’s little treasures, located 90 kms south of Sicily. 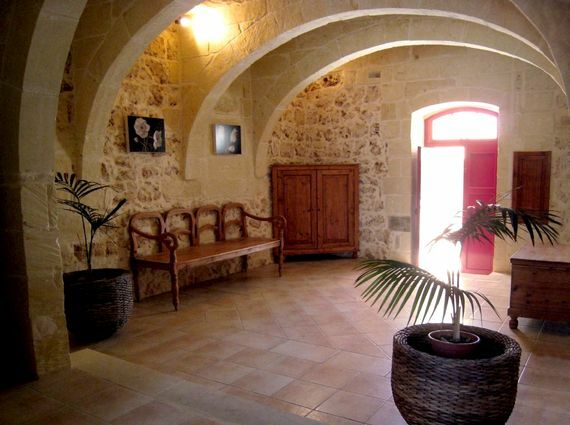 Only 14 x 7 kms in size, all the delights of the coast, countryside and local culture are always close by and Razzett Pepprina provides a superb setting to enjoy the best that Gozo has to offer, tucked in a quiet corner of Xaghra in the centre of the island. The shops and bustling piazza of Xaghra are only 5-minutes walk from the house, offering a choice of restaurants and bars to enjoy the excellent local food and wine, including lots of fresh caught fish and dishes with strong Italian influences. The restaurant Ta Frenc is just 5 minutes drive and widely regarded as one of the finest on the Maltese islands. Throughout the summer, every village throws colourful weekend fiestas with fireworks and traditional horse racing up the main streets. The capital of Gozo, Victoria, is 10 minutes drive. 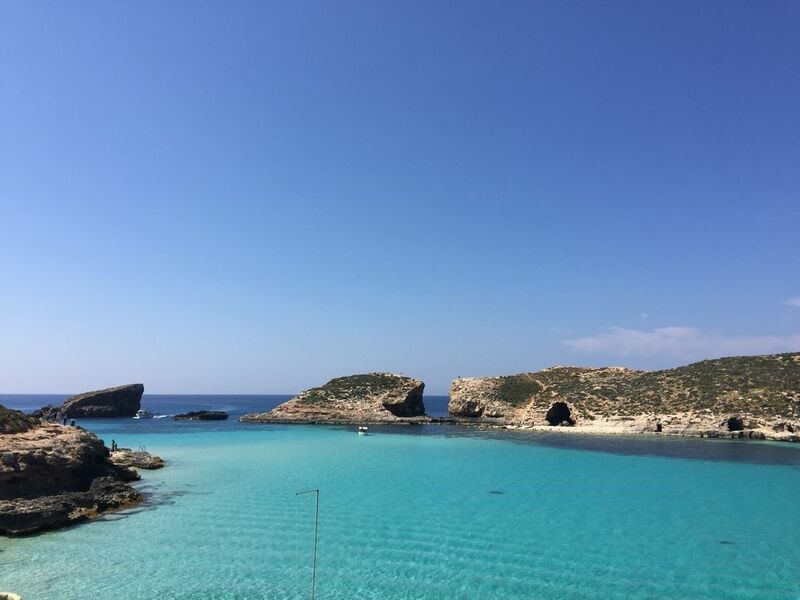 The picturesque countryside makes Gozo popular with walkers and there are interesting archaeological sites to seek out but the coast also boasts sandy beaches, boat trips and world class diving. The orange-red sandy beaches of Ramla and San Blas are a 10-minute drive from Razzett Pepprina and Xlendi and Mgarr ix-Xini are 15 minutes away. 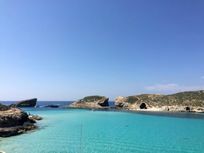 Comino Island and its crystal clear Blue Lagoon is well worth a visit by a 10 minute boat ride from Mgarr harbour. Getting There : Ryanair, Easyjet and Air Malta fly from the UK to Malta International Airport which is 40 minutes drive from the ferry port where the crossing to Gozo takes 25 minutes. Car hire is recommended. We live in the UK with our two young daughters and run a film production company. 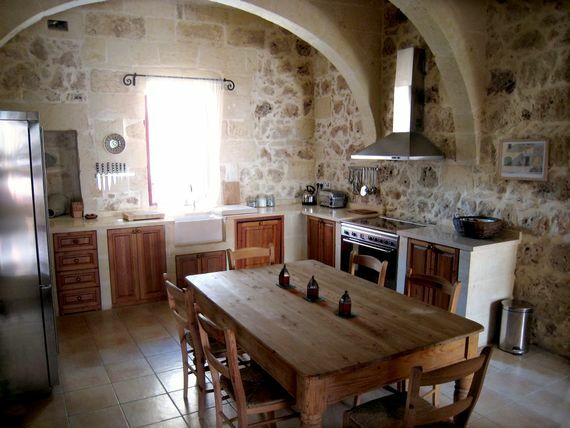 We got married in Gozo in 2000, and bought the farmhouse in 2006. My family are Gozitan, so the farmhouse is a natural second home. 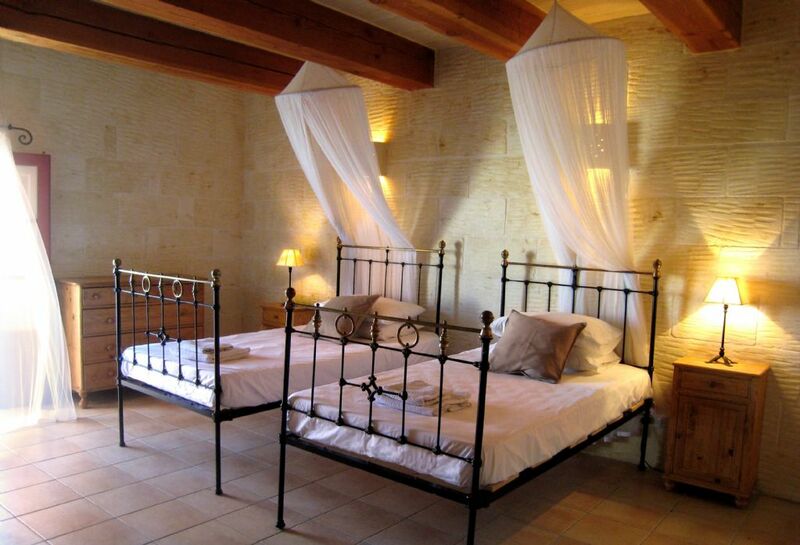 Xaghra is in the centre of the island and close to everything, with the farmhouse itself just off the lively village square, yet in a secluded alley away from crowds and traffic. The Gozitans are really friendly and children are warmly welcomed everywhere. The island offers crystal clear waters and beautiful beaches. The restaurants offer lots of child friendly options including pasta, pizza and delicious locally made ice cream! 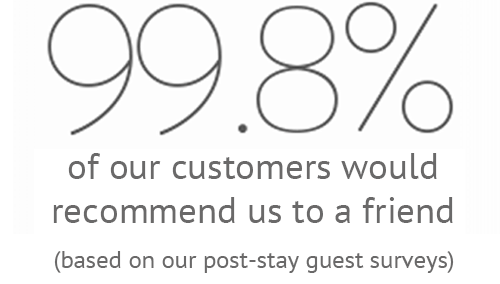 Sleeps up to 8+cots in 2 double bedrooms, 1 twin (with two singles) & a double sofa bed in the twin room. There are a range of beaches within 10 minutes drive. 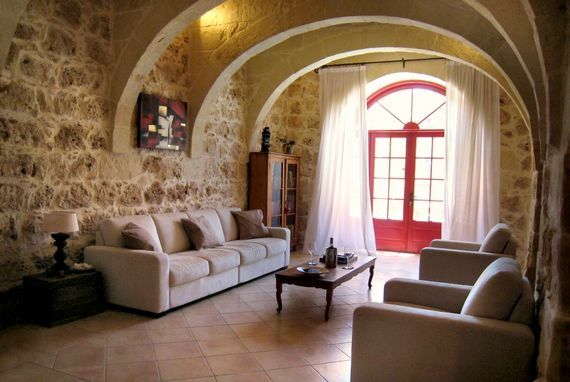 The house is just a 5 minutes stroll to Xaghra Square. There is a private pool with dining terrace, BBQ and sun loungers. Evening babysittin can be arranged. Baby gear provided includes; 1 travel cot, 1 eurobaby wooden highchair, a potty, toilet training seat, a changing mat, plastic crockery, cutlery & sippy cups, hand blender, ice cube trays for pureed food and picnic bag. A welcome pack is provided with bread, local milk , water etc and a bespoke pre-arrival shopping service is available. Massages can be arranged via the concierge service. The house has a private terrace, pool and dining area. 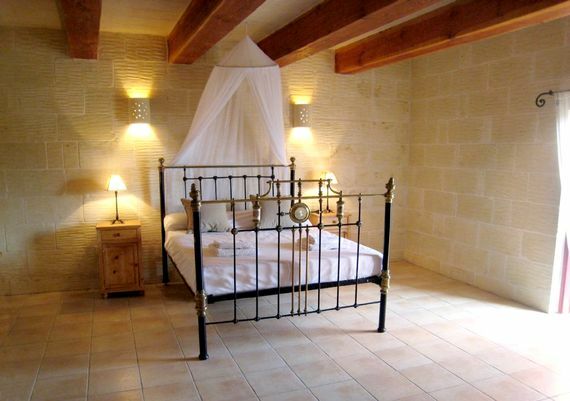 The property is wonderful - extremely spacious and beautifully finished. Just a few minutes from the bustling town square, the location makes this the perfect spot for a stay on Gozo. With its own private pool and lovely outdoor terrace, as well as loads of indoor living space, the whole family was well catered for. This is a lovely property in a quaint town with good restaurants and a few shops. We had a very relaxing week here. It is very baby friendly and the toy chest was very popular! The kitchen is fully equipped and the pre-arrival shopping was very useful. The owner was extremely helpful and gave us a list of all the equipment that was already at the property (including things like steriliser, baby monitor e.t.c.) so this really helped us to pack more lightly than usual. We would definitely stay here again! The pool is solar heated (!) so a little cold for our 1 year-old daughter in late October but I'm sure it is great in the summer months.